There are seemingly endless options when it comes to hardwood flooring. Many people think that color and grain is the only thing that differentiates the various varieties of wood, but there’s more to it than that. Different types of wood have various levels of hardness, and that can be a big factor in determining whether a wood is right for your home. Wood’s resistance to wear and denting is measured by a process called the Janka Hardness Test. In this test, the force needed to embed a small steel ball into the wood is measured. The results can help determine if a type of wood is suitable for flooring. The chart below shows the hardness of some popular wood flooring choices, as based on the Janka Hardness Test. 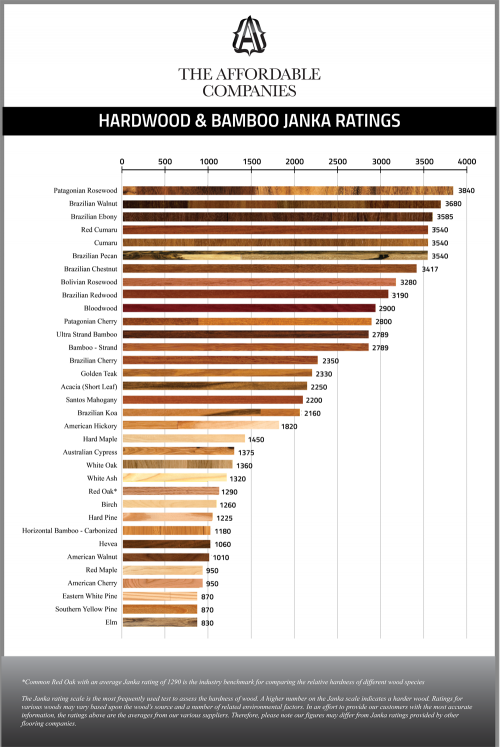 This chart isn’t meant to be an absolute, but it provides a helpful guide for comparing different types of wood. Of course, hardness is just one factor to consider when choosing hardwood flooring. How can you make sure you’ve covered all your bases? Our design team has the knowledge and expertise to help you choose the right flooring for your home. They can help you assess your needs and your budget, and from there help you decide which type of wood is right for your home. Contact us today with your questions, or stop by our showroom to see all we have to offer. Need more inspiration? Check out our Flooring board on Pinterest.